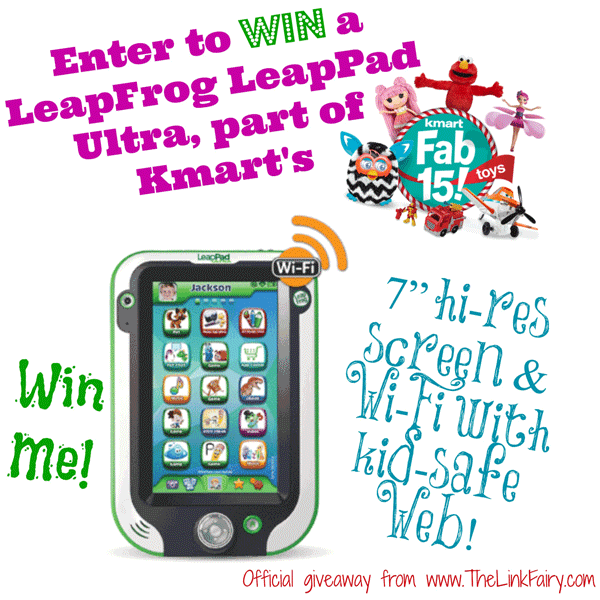 Enter to win a LeapFrog LeapPad Ultra, part of Kmart’s Fab 15 Toys List! Kmart’s Fab 15 toys list is sure to bring a smile to your children’s faces. One of the toys is the LeapFrog LeapPad Ultra which we are giving away to one very lucky winner! What’s on your child’s wish list this season? Enter to win below! Good luck everyone! Get your kids learning this holiday season with their own LeapFrog LeapPad™ Ultra, one of Kmart’s Fab 15 toys! Built kid-tough with a 7-Inch hi-res screen and Wi-Fi with kid-safe Web. Check out a review of the LeapFrog LeapPad Ultra on The Link Fairy! Plus find out more about Kmart’s Fab 15 Toys List. Enter through the widget below. Giveaway ends on 12/18. Open to US residents 18+. This giveaway is in no way affiliated with facebook, twitter, G+, instagram or pintrest. Giveaway Bandit is not responsible for prize fulfillment. For questions regarding the giveaway or to have your product featured in a giveaway, contact Rachel at topfairy@thelinkfairy.com. My favorite feature is the kid-safe web. My favorite feature is the kid-friendly web! Great for kids! Thanks for the giveaway. I like that it has front and back cameras. I also like that there are over 800+ apps! I like the text messaging app. my girls would love that they could text me at any time! I love the downloadable apps and parental controls! Thanks for the chance to win! I like the parental control settings to keep kids safe online. I like all the apps & the parental controls & the fact that it amuses the kids for a long time! It’s kid proof! We had an Android tablet and couldn’t find a case for it, the screen was smashed within days. This is so much better for kids! I love that it’s kid safe, very important to me, to protect what your children are exposed to. My daughter would love the Art Studio! I like that it is wi-fi kid safe.